Small Business Coaching - The Method That Boosts Cash. Every Houston small business owner I know wants to earn his slice of the pie. At least the ones I know do. But many wouldn’t have a steady amount they’d like to withdraw from their business each month. I suggest deciding your salary you want from your small business. It takes discipline. It takes planning. And it takes foresight. Forecast accurately so you can secure your salary. Forecasting cash in small business is a science. Some call it an art. I call it planning. Control spending. Check fixed costs. They offer enough opportunity to step up efforts. Marketing costs balloon out of size fast. Keep a tab on them. Measure marketing return on spending. Check revenues and gross profit you need to make net profit. Next, check balance sheet items to get reasonable cash position. 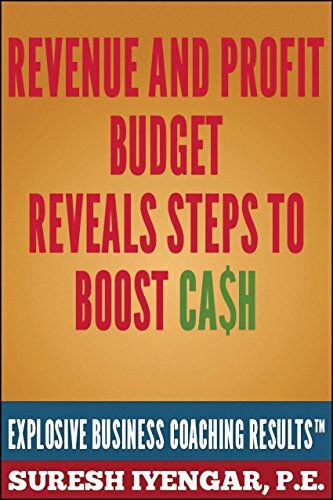 Using revenue and profit budget will tell you the story of your past efforts. It could also tell you the future story if you use forecasts. Use one of 2 methods. Using Microsoft Excel, plan out month-by-month how you can breakeven. It’s the point where your profits exceed expenses. It’s the ratio of fixed costs and percent gross profit. Then drive forward for net cash position. Use a sensitivity analysis tool. Focus on income. Pick your sales growth rate. Pick your percent gross profit for the year. Pick your expense growth rate. Next, focus on balance sheet. Select the number of days to collect money sell goods and pay bills. For end of year, pick current, fixed, intangible and other assets. Select current liabilities you expect. Using sensitivity projection, you could see your targets each month of the year. Change them as you see fit. They aren’t cast in stone. Use them to drive your business forward. Take these steps. And you’ll see results, maybe faster than you thought possible. Importantly, it will secure the salary you want.